Have you heard of Mathopoly (not to be confused with Monopoly)? Because…our followers loved our “How to Win at Monopoly” post on Facebook so much, we wanted to share an even more math-related Monopoly called Mathopoly! I had never heard of this game before now, but it’s definitely intriguing. 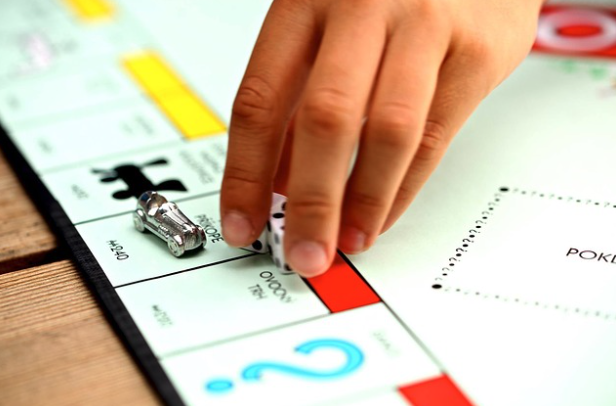 I grew up loving the game Monopoly, considering it was a game my entire family would play together for days on end until we finally finished it (you know what I mean!). I had never really thought about a board game like this enhancing your math skills, but there’s actually quite a few considered to be helpful! These games include Qwirkle, Splendor, Ticket to Ride, Mathopoly and many more. Mathopoly and all the other games listed are great games to test your math skills in different ways. These games may not teach math traditionally on the surface, but they all have at least one lesson to teach. This lesson can range from strategy to problem solving, or even recognizing patterns! What is Mathopoly, and how do you play? Mathopoly (Mathematical Opportunities using Poly-Numerals) is a game based on Monopoly except there’s math involved to move forward in the game. As you would in Monopoly, players roll to see who gets the highest number to go first. Then, that first player rolls and moves the amount of spaces shown on the dice. Based on the space you land on, you answer a math question. If you answer the question correctly, you then own the space if available or move on to the next player. This is a game that can allow students to learn math concepts in the place of worksheets, or as a supplement. This game could also create a different type of feel for learning math. All you need is the game, some mini whiteboards or scratch paper for those math problems, maybe a calculator, and players to join in the game. Speaking of players, you’re also probably wondering what type of players are meant for this particular game. Mathopoly is recommended for ages 10+ and are geared towards grade level curriculum. The curriculum the questions are based on are grades 5 through 8 (an add-on can also be bought to add grade 4 curriculum to the mix, too). Its also a great way to get ready for our national student math competition, MathCON! MathCON is a nonprofit national mathematics organization recognized for its annual student mathematics competition. This mathematics competition is for students in grades 5-12 and has had more than 200,000 student participants since 2008. Last year alone there were 50,000 students who were involved in the MathCON competition! Participants range from schools to individual students with charter schools, public schools, private schools, home school students and individual students registering each year. To participate, please register at www.mathcon.org/+. Also, don’t forget to subscribe to our YouTube Channel ‘MathCON- National Student Math Competition’ (& make sure to click the bell for notifications!) to see our new series. Follow us Facebook and Twitter too!